A new survey is underway to find out more about legal highs in the UK and to try and determine how they are used, who is using, them, why, and ultimately find out ways of providing help and tackling the problem. It’s being undertaken by the Centre for Drug Misuse Research, and is the first of it’s kind in the UK to specifically concentrate on individuals’ use and views of legal highs. Legal highs are substances that mimic the psychoactive effects of illegal drugs like cocaine, ecstasy, cannabis, and amphetamines, but they’re not currently illegal to use or possess. No one really knows how many people in the UK have taken a legal high, or what legal highs people are taking, or what people experience after taking legal highs. 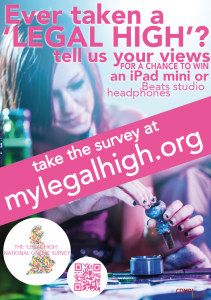 So the survey has been launched in order to give people the opportunity to tell the research group about their experiences of taking legal highs, and to gather data. Please click on the image to download the poster if you want to promote the survey. All your answers are strictly confidential, and you and as a thanks for completing the survey, you’ll be entered into a prize draw to win an iPad mini or wireless Beats Studio Headphones. Legal Highs Could be More Addictive than Illegal Drugs?